Crafty Spices second award, how exciting is that!! 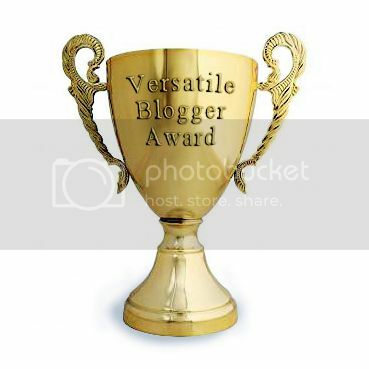 This time is the Versatile Blog Award, and of course I have no idea what is this award about, except for the fact that it is named versatile blog, I guess people do appreciate versatility :). After doing a little research the closes that I’ve gotten in finding out what is the “Versatile Blog Award” is the quote below, I found the same exact quote in multiple sites, unfortunately without pin-pointing to the exact origin of the quote itself. “As far as I can tell — details are rather sketchy and only the creator knows for sure — this lofty-sounding award is basically a mutual admiration society where bloggers recognize their peers for writing quality blogs that touched them in some way. The VBAs honor the blogger rather than specific posts. It’s a chance for bloggers to pat themselves on the back like the American Academy of Motion Picture Arts and Sciences does with the Oscars. Until someone starts giving out Blogscars, the VBAs will have to suffice”. Now that we know a little about the award, I first need to thank Raven Green at “msmommyhh6” for nominating us for this award. She is a wonderful blogger, an Army wife, mother and special needs advocate. She has a very versatile blog where she talks about all topics mom related (Cooking, Cleaning, kids, reviews, and many other topics), she is also a business owner and seems like a very active person. MS MommyHH6 weekly schedules features personal posts, guess posts, surprise Sunday Post, and a special "6" list! If you haven't done so yet, please visit her site. Thank the person that gave you the award in a blog post and link back to their blog. Pass the award on to 15 bloggers. Notify your nominees by leaving them a comment. I don't like to argue, but I do stand-up for my believes. I have a brother that has been in the US Army for 16 years. I like when my husband puts gas to my car. I learned to swim on my own and now I enjoy teaching my little one. I try and try, but I can never get myself to bed early. Thank you everyone for stopping by. I hope you find the bloggers I nominated as inspiring as I have. Spice your life and share the recipe! Thanks a million for the nomination - I really appreciate it! I just wanted to tell you thank you for nominating me for the Versatile Blogger Award! It is an honor and so sweet of you! I am short on time today so I will not be able to complete the rules to accept- but I wanted to be sure to thank you! I am going to share your blog on my Facebook page to show my appreciation! Have a wonderful week! I just stopped by your site and facebook page, thanks for the comment. Hope to keep in touch.